After dating a slew of famous actresses, in 2007 George Clooney began dating Sarah Larson, a former Fear Factor contestant, and cocktail waitress. After their split Larson did not pursue the spotlight, in fact, said she avoided it and all the attention was difficult. When asked if there were any hard feelings between the two she replied, “Not necessarily that there’s hard feelings but we just haven’t, you know, the same thing. When you break-up, it’s difficult but you move on.” The couple split in 2008, and the last we heard Larson was managing a medical spa in NYC. We’re not sure where Sarah Larson is today, but we wish the best for her. 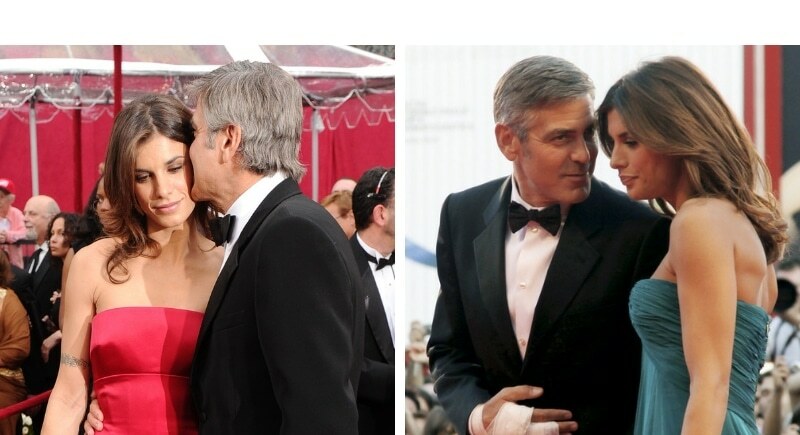 A year after breaking up with Sarah Larson, George Clooney was spotted on the red carpet with a new leading lady, Italian actress Elisabetta Canalis. The pair dated from 2009 until 2011. Interestingly enough, after their breakup, Canalis and Clooney were among 200 witnesses accepted by a Milan court in the trial of former Italian Prime Minister Silvio Berlusconi for allegedly for some pretty serious crimes he had committed. Today, Canalis is married to an Orthopedic surgeon, and Clooney has, of course, moved on and married British-Lebanese lawyer Amal Alamuddin.